Shrimp Aguachile in Mango-Habanero | Mexican Recipes, it is very easy. Aguachile, a popular shrimp cocktail from the state of Sinaloa, is made in a similar way as a ceviche/cebiche, where the shrimp is prepared with lime juice. In Sinaloa, it is made with slices of cucumbers, red onion, and fresh chiltepin pepper or Serrano pepper. The locals like to make this dish with fresh (never frozen) shrimp and add the lime-pepper marinade just before serving. 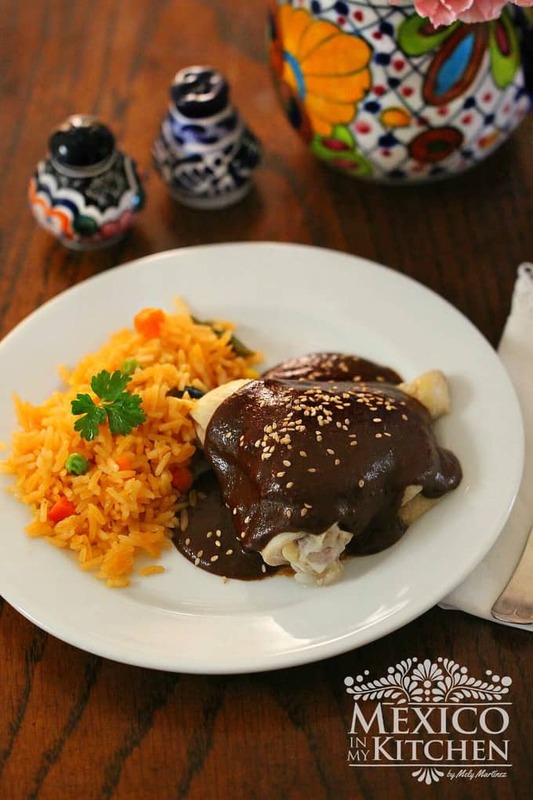 This mouthwatering recipe comes from my guest today on the blog: Renown Mexican Chef Julio Ortega. Julio is graduated from the Mexican Superior Culinary Institute in Mexico City, and during his professional life, he has represented the Mexican Gastronomy many times, either by working as a chef or attending seminars and culinary events around the world in places like Switzerland, Germany, Spain, and Indonesia. Nowadays, besides managing his own culinary shop “OJ” in Monterrey, NL (where he teaches courses and workshops to professional and aspiring chefs), he travels around the country giving conferences about the new cuisine trends, sharing his passion for food presentation and the experimental and sensory food trends. Today he shares with us this mouthwatering dish that is so popular in our coastal towns but with his own unique presentation and combination of flavors. While the shrimp is marinating, prepare the tostadas. Mix masa-harina with the lard and warm water until you form a smooth dough. If it needs more water, add a few teaspoons at a time. Divide the dough into 8 small balls, and form the tortillas. Cook over a hot griddle, turning twice. Let them dry on the griddle until they are crispy. Remove and place on the serving plates. To serve, divide the shrimps over the tostadas and garnish with the red and green onion and chopped cilantro, as well as a few drops of avocado oil. Enjoy! Shrimp Aguachile, a popular shrimp cocktail from the state of Sinaloa, is made in a similar way as a ceviche/cebiche, where the shrimp is prepared with lime juice. In Sinaloa, it is made with slices of cucumbers, red onion, and fresh chiltepin pepper or Serrano pepper. You can use store-bought tostadas. To know more about Chef Julio Ortega courses and future presentations, visit his Facebook page HERE. Yum! Love the flavors here with ginger and mango and shrimp, delicioso! !